• To properly illuminate a subject, with a motivated source. • To fill in shadows created by such motivated source. • To separate the subject from the back ground. The motivated source or the key light is the most obvious source of light in a lighting triangle. It often creates harsh shadows. The fill light compensate the harsh shadows by filling the darker areas. The third main source of illumination is called the back light, also sometimes referred to as a ‘rim’ light. The back light’s chief function is to separate the subject from the background. This helps create the illusion of depth and three- dimensionality on our two- dimensional television screen. In a normal lighting design, back lights, like key and fill lights, are placed above and directly behind the subject. Sometimes back lights are placed opposite the key light. As we can see in the overhead diagram (shot - 1) the key light is at right angles to the fill light and the back light is positioned behind and above the subject. 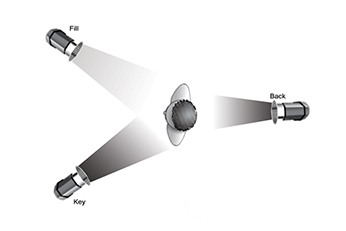 The cross fire between the key and fill light and the backlight positioned exactly above and behind the subject, explains the basic lighting triangle followed initially by all professionals. The ratio of lighting between key, back and fill light is (1:1:1/2).Supposedly, if the key light is measured at light intensity of 500 f.c. (foot candles), the back light too should be calculated at an intensity of 500 f.c. (foot candles) and the fill light at a lower intensity of 250 f.c. (foot candles). Now, under many circumstances one may choose to differ with the above mentioned lighting ratio to suite creative needs. Now, for instance if we have a poorly lit back ground one may choose to increase the intensity of backlight to the ratio of (1:1 ½:1/2), which results to an increase of 250f.c of back light than the key light. The three-point lighting on many occasions proves to be restrictive if more than one camera angle is desired. In many such cases the four-point lighting is used. Apart from providing wider camera angle, the easier nature of set up is an added advantage to four-point lighting. However, nature of light is very flat. It uses four spot lights. 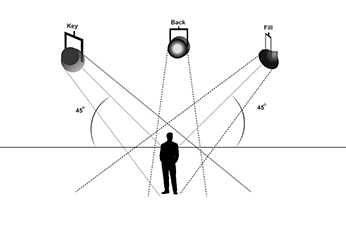 The lighting ratio in four point lighting is 1:1 for all the lights i.e. all four lights illuminate in the same intensity.